In the 21st century, there has been a tremendous resurgence in rye whiskey. Not long ago few drinkers could name a single brand of rye. Today, however, there are a number of quality ryes to choose from with names that have become almost as regular in conversation as the popular bourbons. 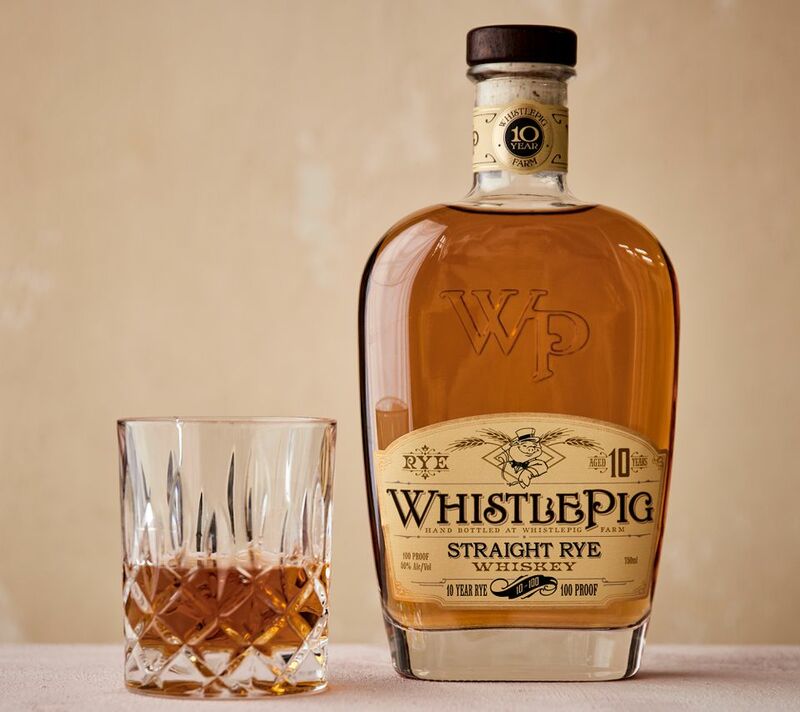 WhistlePig is one of those and it has made a significant mark in the American rye whiskey market. The story of WhistlePig began with the 2007 purchase of a Vermont dairy farm by founder and CEO Raj Peter Bhakta. He teamed up with former Maker's Mark Master Distiller David Pickerell (a legend in the whiskey world who passed away in 2018) to develop a rye whiskey that took on the farm's new name. The goal was to create a single malt, single estate whiskey using the farm's organically grown rye. The advantage of this 100 percent rye whiskey is that you get the raw taste of a grain that is more robust and flavorful than corn or any other grain used in whiskeys. It's something they pulled off very nicely. In the end, WhistlePig has become a favorite for those who appreciate full-flavored rye. The brand once used the phrase "rugged grain refined" and it is an accurate description of what you will find in every bottle of WhistlePig. Any whiskey takes time to develop using ideal methods; WhistlePig is a good example of quick sourcing and perseverance. The first bottles were released in 2010 after Pickerell found a Canadian rye whiskey that met his esteemed standards—he was a tutor for many professionals on the finer points of whiskey tasting—and decided to put it to better use than the Canadian whisky blends it was intended for. They then implemented a two-barrel aging process to further show off the spicy rye. The first round of the 10-year aging process for WhistlePig's signature bottling happens in new American oak barrels and the second in used bourbon barrels. This gives the whiskey the best of both worlds, adding unique undertones to the finished product. In 2014, the Vermont government gave WhistlePig permission to build their own distillery on the Shoreham farm where the rye is already grown and the hand-bottling takes place. The distillery, complete with a copper pot still designed by Pickerell, has been in full operation there since 2015. WhistlePig has continued to evolve. Initially, it was a one-bottle distillery, producing WhistlePig 100-100 Straight Rye Whiskey. That 100-proof bottle remains the flagship but is now simply labeled "10 Year." In the years since, the distillery has branched out and now offers a number of different whiskeys, all of which are worth exploring. The distillery has taken on what they call a "Triple Terroir" philosophy, meaning the grain, water, and oak are all sourced from the farm. The new oak barrels that all the whiskeys hit first are made from trees harvested in Vermont. The theory is that the shorter growing season develops more growth rings in the trees, which ends up adding flavor to the whiskeys. To get a full appreciation of this, try WhistlePig 15 Year Whiskey, which is finished in the "Vermont Estate Oak" and bottled at a relatively gentle 86 proof. The distillery also offers a 12 Year "Old World Cask Finish" Whiskey. This one is a blend of whiskeys finished in casks that once housed port wine, French Sauternes, and Madeira. It's a treatment that many Scotch whiskys receive, so you get to enjoy that aspect backed by the signature rye spice, which is a fascinating experience. Farmstock is their annual release that shows off the Triple Terroir perfectly. Each round uses a specific crop of rye, is married with hand-selected aged whiskeys, and aged in their estate oak. It's also, rather amusingly, labeled "Bottled in Barn." The Boss Hog is a wonder for true fans of rye whiskey. Each edition takes on a new theme and characteristic, but they're always a very powerful rye whiskey that lives up to the name. The Boss Hog V, for instance, is barrel-strength rye aged for 13 years and finished in former calvados casks. The apple brandy finish is reported to be in honor of Mauve, a pig on the farm who loves her apples. In general, rye whiskeys can take some getting used to if you have been drinking smooth, corn-dominated bourbons and blended whiskeys. Rye is not a delicate grain but has a poignant spice that gives the whiskey a very distinct taste. Think of the last time you ate rye bread and tasted that signature dark spice; this is what you will (hopefully) learn to love about a pure rye whiskey like WhistlePig. This is a rye whiskey that is great on its own if you appreciate rye spice. If you're drinking it straight, you will find its bouquet open up nicely when a little water is added or you chill it with an ice ball. It will mellow the flavor perfectly and cut the proof down just enough to transform it into a savory sipper. None of the WhistlePig offerings are what most drinkers would consider affordable. These are premium whiskeys with price tags to match; a bottle of the 10 Year sells for upwards of $60 and The Boss Hog can sell for nearly $200. With that in mind, it's important to treat these whiskeys with respect in cocktails. This is a cocktail-worthy whiskey, though, and for the 10 Year, at least, that's where it shines. Keep the drinks simple and use it in recipes that show off the rye. Start out with the classics that were meant to have rye like the Manhattan, Sazerac, and ​Waldorf (it is fabulous against the anise flavors of the last two). From there, you'll know where else you want to take this whiskey. Just don't let the price tag stop you from mixing with it! WhistlePig deserves a well-chosen mixed drink as much as any other whiskey.